Ever since the Large Hadron Collider debuted in 2008 (it went operational for a few days then was closed due to a minor glitch) at the European Organziation for Nuclear Research (CERN), CERN has become the "go-to" place for science research and discovery. Prior to the LHC, the US had the largest particle accelarator in the world, the Tevatron. 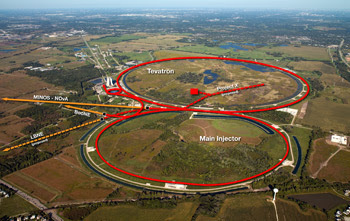 It was located at the Fermi National Accelerator Laboratory (also known as Fermilab), just east of Batavia, Illinois. 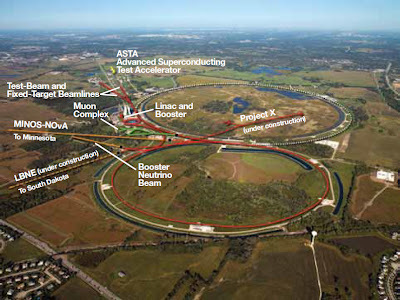 Last year, the Tevatron closed down on 30 September, 2011, due to budgetary cuts. It seems that the US has conceded the science race to their European counterparts at CERN. Fermilab has developed a twenty-year plan that keeps the laboratory, and the United States, at the forefront of the global quest to discover the fundamental nature of the physical universe. This Plan for Discovery builds on the record of excellence in scientific research and technological innovation that Fermilab and its community of users have established over the course of four decades. It makes the best possible use of the laboratory's existing world-class accelerators, experiments and technical infrastructure and systematically builds new capabilities that support groundbreaking particle physics and accelerator science research. Use the world's most intense beams of neutrinos, muons, kaons and nuclei to explore new physics in unprecedented breadth and detail. Build Project X, the world's most powerful proton accelerator, to propel these experiments to even greater sensitivity and to establish a versatile technical foundation for future accelerators. Construct the Long-Baseline Neutrino Experiment, a leap forward in the quest to understand the properties of neutrinos and the origins of a matter-dominated universe. Study new physics at the highest energies with experiments at the Large Hadron Collider and contribute to major accelerator, detector and computing upgrades. Build and operate world-leading experiments to explore the nature of dark matter, dark energy, cosmic rays and quantum spacetime. Build the technological base for future accelerators and particle physics detectors. The study of the mysterious properties of neutrinos is one of the highest priorities in particle physics. Fermilab today produces the world's most intense high-energy beam of neutrinos. Upgrades to the accelerator complex over the next few years will double the proton beam intensity and support a new suite of experiments with muons and neutrinos. The keys to Fermilab's long-term future are two facilities that could be operating in the 2020s: the Long-Baseline Neutrino Experiment and Project X. LBNE will take the next major step in the quest to measure and understand the properties of neutrinos and determine their connection to the observed excess of matter over antimatter in the universe. The Project X accelerator complex will be unique in the world in its ability to simultaneously deliver high-intensity proton beams in different formats to multiple experimental areas. Project X experiments using neutrinos, muons, kaons and nuclei will provide new windows on phenomena not accessible at particle colliders, and will be essential to break through to a deeper understanding of nature and the origins of matter. Fermilab's Plan for Discovery is strategically aligned with the national particle physics program and takes into account existing and planned facilities around the world. It is pragmatic and flexible enough to meet the challenges posed by new discoveries and changing worldwide economic realities. The plan builds on the laboratory's ongoing experimental and theoretical physics efforts, accelerator and detector R&D programs and computing capabilities. It relies on the creativity and expertise of Fermilab's staV and users from universities and research institutes across the country and around the world. It keeps the laboratory and the U.S. particle physics community on the path to discoveries wherever they may be found, whether in experiments at Fermilab using the highest-intensity beams of particles, at the highest-energy particle colliders around the world, or from measurements of matter and radiation in the cosmos. 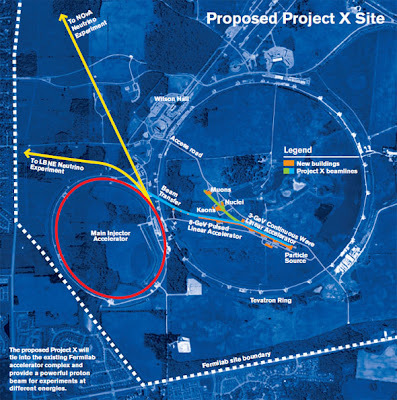 Project X is a proposed proton accelerator complex at Fermilab that would provide the particle physics world with powerful and sensitive tools to explore a new scientific frontier. This facility would provide particle beams to multiple experiments searching for rare and hard-to-detect phenomena that will further our understanding of fundamental physics.